When an international team goes around the country, it is inevitable that fans in that area will have a certain preference for certain players. The international fans are likely to be the same fans that come to see basketball being played on a regular basis and if there is a player with a link to the area, it is likely that they are the players that the fans will cheer for most. It is perfectly naturally that local fans will cheer for more players that see on a regular basis but in Chicago, the Team USA player that all of the eyes were on was a player who hasn’t been seen on a basketball court in Chicago too often of late. This is because the USA versus Brazil game was the first time that Derrick Rose had played in Chicago since November of 2013. When you think that the player also missed the entire 2012/13 season with an injury, you would be forgiven for thinking that basketball fans in Chicago may have forgotten what he looks like. 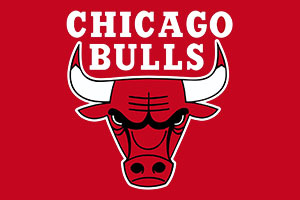 There were plenty of cheers for Rose when he was on the court, with the player being encouraged to shoot on a regular basis, but you get the feeling that Bulls fans were rather concerned for the players’ wellbeing. When you have a player that has been out for so long, any injury or knock, no matter how innocuous, can be a cause for concern. 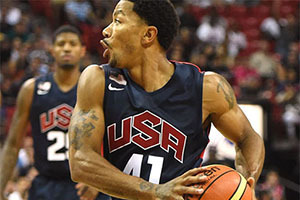 Will Rose ensure Team USA grabs the gold? If you believe that Derrick Rose is exactly the sort of player that will ensure Team USA live up to their billing as favourites at the FIBA World Cup, you have the opportunity to place a bet on him. There is the opportunity to take advantage of the futures market for the 2014 FIBA World Cup before the event gets properly underway at the end of the month in Spain. Team USA are the hot tip for the tournament although the host nation appears to be getting quite cocky and confident about their chances of lifting the trophy on home soil. Team USA managed to win the contest by a margin on 98 to 78 and Rose managed to play a part in the victory in the 24 minutes court time that he got. He managed to pick up 7 points while also adding a steal, a block, two assists and four rebounds. This was more than enough for one run out and you can bet that the Bulls fans enjoyed seeing their man in action, although they would have much preferred to have seen Rose in their own club uniform as opposed to the kit of their country. It is one thing being patriotic but when it comes to basketball, many fans will agree that club comes first. With the USA still to announce their final squad, there will be some local fans who would much prefer Rose to stay at home this summer, rather than heading to Spain. A good rest may see Rose in the mix for a great season but who knows, if he is selected and performs well, he may find that his confidence and fitness is flying in time for the new NBA season. This is definitely the outcome that Chicago Bulls fans are looking for with respect to Derrick Rose.